While it seems that you have collected a lot of injuries, regular and effective exercise is not impossible. I’ll agree that the more you have going on the more specific and selective your program has to be. When we look at it, our bodies are great at compensation. If we hurt our hip our back will compensate for it, or if we hurt our neck our trunk will adjust to help out. But as we collect injuries, our body’s ability to compensate becomes limited. As a result we become more limited in the things we do. This may be why you are having a hard time finding an exercise program that works for you. With injury comes muscle weakness and joint instability, which lead to pain.Their are only 2 ways to regain stability, surgery (which doesn’t automatically solve your problems) or exercise to strengthen the muscles around the injury. Let’s look at your exercise options. With the list of problem areas that you’ve given, isometrics and lower impact exercises would provide a safe starting point for building strength. Remember that it is the instability, or the uncontrolled joint movement, that usually leads to pain. So being able to control movements is helpful to limit the stress on the body. 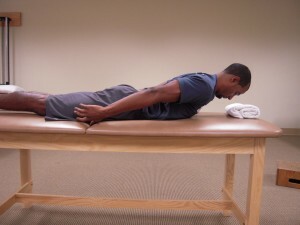 Isometrics are easy to do and pose little threat of re-injury. Areas of concentration would be the upper back/shoulder blade muscles, the lower abdominals, and the gluteals. These muscle groups are vital for core stability. Walking, swimming or cycling may be good lower impact activities for you. 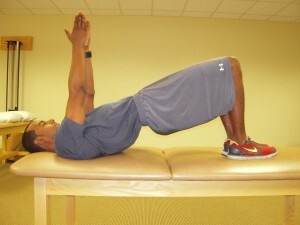 Make sure to focus on stabilizing your core while performing these exercises. In all start slowly, be consistent, and patient. Lie on your back with your knees bent and feet hip distance apart. Place your fingertips just inside your hips so they are resting on your abdomen. Use your abdominal muscles to pull your belly button towards your spine. If you are doing this properly you should feel the muscles underneath your fingertips tighten. Lie on your stomach with your head off the edge of the table. Squeeze your shoulder blades together and perform a chin tuck lengthening the back of your neck. Lie on your back with your knees bent and arms at your side. Tighten your abdomen and your glutes and lift hips off the table. As always if you have pain with any exercise you should stop immediately and seek professional help. These are just a few basic stability exercises that whole workouts can be built upon. I encourage you to take charge of your back and neck health. Get educated and let’s get started. For more information about back and neck pain and where to go, we’re always here for you. Just contact our office or just leave us a comment on this post and we’ll be glad to help you like we’ve helped so many of our patients.